You setup Hyper-V but none of your VM’s seem to have internet. 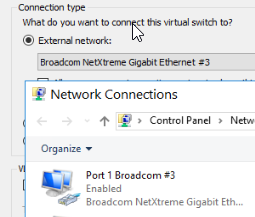 You have your ethernet cable in port one, and you have your Hyper-V Virtual Switch Manager properties reflecting NIC1. 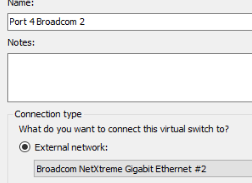 I changed the names of the connections to reflect what Broadcom number windows assigned to it. To help me link up the Hyper-V virtual switch. In the Properties I assigned the same name as I did the connection for easy reference.